One of the things I am always interested to know is "What do artists that I listen to actually listen to themselves?". Well, "Back to mine", one of the lesser mainstream series of almost ubiquitous late night/after hours/chill-out compilations, brings us just this. 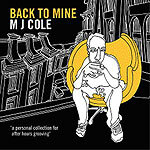 Two quiet years on from the Mercury Music Prize nominated "Sincere", "Back to mine" sees UK Garage's writer, producer, remixer & performer, MJ Cole, deliver a diverse musical journey through his record collection. From the big, Bassey-esque vocals on Cinematic Orchestra's "Diablous" through hip-hop & reggae, to the sweet soul harmonies of Omar and the Commodores. Each track blends effortlessly with the next where you would least expect it. The Mediterranean feel of Zero 7's 'Destiny' and Groove Armada's downbeat dub of HBMS's 'Sunshine' take us to an Ibizian beach bar to see the sunrise before the more familiar garage beats of LTJ Bukem's 'Music' and Cole's own remix of Goldie's 'I Believe' round the evening off like a fine aperitif. Jazz and classical influences are apparent throughout and work well alongside more "modern" styles. Cole's classical training seems to have been put to good use given his clever choice of tracks. It was a truly memorable journey and one that I will take again and again. Make sure you get yourself a ticket.